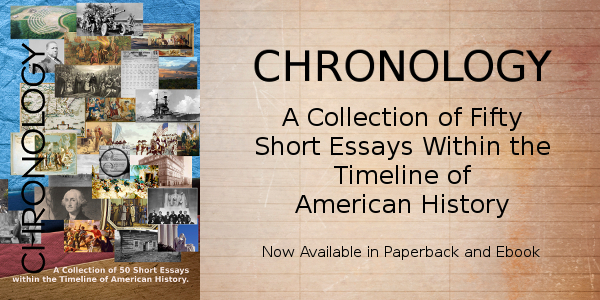 What roared into the beginning years of the 20s would go south in an instinct with the Stock Market Crash of 1929, taking the prosperity of the decade with it, and another decade plus the beginning of a Second World War to begin its correction. Be your own history detective. Across the United States, national, state, and local historical socieites have placed roadside markers telling their historical stories. While some of these markers are in out of the way places, their import to the fabric of the U.S. tale are no less important. 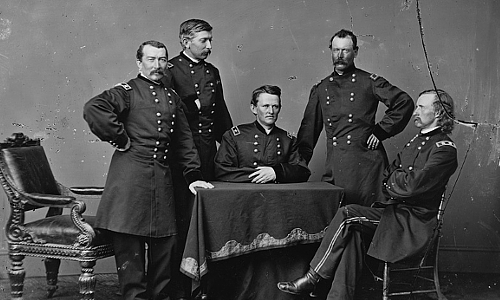 Many of them cover some of the lesser known battles of the Civil War, including Trevilian Station. Photo above: Prohibition Era Brewery. Courtesy National Archives. Right: Photo montage, images courtesy Library of Congress. Sponsor this page for $300 per year. Your banner or text ad can fill the space above. January 1, 1920 - For the first time, the 1920 census indicates apopulation in the United States over 100 million people. The 15% increase since the last census now showed a count of 106,021,537. The geographic center of the United States population still remained in Indiana, eight miles south-southeast of Spencer, in Owen County. January 10, 1920 - The League of Nations is established with the ratification of the Treaty of Versailles, ending the hostilities of the first World War. Nine days later the United States Senate votes against joining the League. February 3, 1920 - The first performance of the play, Beyond the Horizon, is held. The play by Eugene O'Neill would win the first of his four Pulitzer Prizes. August 18, 1920 - Women are given the right to vote when the 19th Amendment to the United States constitution grants universal women's suffrage. Also known as the Susan B. Anthony amendment, in recognition of her important campaign to win the right to vote. September 17, 1920 - The American Professional Football League is formed in 1920 with Jim Thorpe as its president and eleven teams. It would change its name to the National Football League in 1922. November 2, 1920 - A landslide victory for Warren G. Harding in both the Electoral College and popular vote returns the Republican Party to the White House. Harding gained over 16 million popular votes to Democratic candidate James M. Cox's 9 million and won the Electoral contest with a 404 to 127 landslide. This was the first election in which women had the right to vote. May 19, 1921 - A national quota system on the amount of incoming immigrants is established by the United States Congress in the Emergency Quota Act, curbing legal immigration. July 2, 1921 - A Congressional resolution by both houses is signed by President Warren G. Harding, declaring peace in World War I hostilities with Germany, Austria, and Hungary. The treaties would be executed one month later. July 10, 1921 - The proposal for a trail along the Allegheny Mountain ridges is put forward by regional planner Benton MacKaye. The trail, completed in 1937 and designated officially as the Appalachian National Scenic Trail in 1968, stretches from Maine to Georgia. September 7-8, 1921 - The first Miss America pageant is held in Atlantic City, New Jersey. It is won by Margaret Gorman for the title of the Golden Mermaid trophy, later dubbed Miss America. November 12, 1921 - The Limitation on Armaments Congress convenes in Washington, D.C.
February 5, 1922 - Reader's Digest is founded and the first issue published by Dewitt and Lila Wallace. February 6, 1922 - The Armaments Congress ends. It would lead to an agreement, the Five Power Disarmament Treaty, between the major world powers of the United Kingdom, France, Italy, Japan, and the United States, to limit naval construction, outlaw poison gas, restrict submarine attacks on merchant fleets and respect China's sovereignty. April 7, 1922 - The Teapot Dome scandal begins when the U.S. Secretary of the Interior leases the Teapot Oil Reserves in Wyoming. May 5, 1922 - Construction begins on Yankee Stadium in New York City, often dubbed the House that Ruth Built. May 30, 1922 - The Lincoln Memorial, located on the opposite end of the National Mall from the Capitol building, is dedicated in Washington, D.C.
January 23, 1923 - The 12th century Aztec Indian ruins in New Mexico are proclaimed as a National Monument by President Warren G. Harding, following in the footsteps of all presidents since Theodore Roosevelt. It is known as Aztec Ruins National Monument. March 2, 1923 - Time Magazine is published for the first time. April 4, 1923 - Warner Brothers Pictures is incorporated. April 15, 1923 - The first sound on film motion picture Phonofilm is show in the Rivoli Theatre in New York City by Lee de Forest. August 2, 1923 - President Warren G. Harding dies in office after becoming ill following a trip to Alaska, and is succeeded by his Vice President, Calvin Coolidge. Coolidge would oppose the League of Nations, but approved of the World Court. January 25, 1924 - The first Winter Olympic Games are held in the French Alps in Chamonix, France with sixteen nations sending athletes to participate, including the United States, which won four medals. Norway, with four gold and eighteen medals total had the most in both categories. The Winter Olympic Games have been held since this year, except during World War II. February 14, 1924 - The IBM corporation is founded. May 10, 1924 - J. Edgar Hoover is appointed to lead the Federal Bureau of Investigation. June 2, 1924 - All Indians are designated citizens by legislation passed in the U.S. Congress and signed by President Calvin Coolidge. The Indian Citizenship Act granted this right to all Native Americans that had been born within the territory of the United States. November 4, 1924 - Calvin Coolidge wins his first election as President, retaining the White House for the Republican Party over his Democratic foe, John W. Davis, and Progressive Party candidate Robert M. La Follette. The Electoral margin was 382 to 136 (Davis) to 13 (La Follette). January 5, 1925 - Nellie Tayloe Ross is inaugurated as the first woman governor of the United States in Wyoming. Miriam Ferguson is installed two weeks later as the second during a ceremony in Texas. June 13, 1925 - Radiovision is born. The precursor to television is demonstrated by Charles Francis Jenkins when he transmits a 10 minute film of synchronized pictures and sound for five miles from Anacostia to Washington, D.C. to representatives of the United States government. July 10, 1924 - The Scopes Trial or Monkey Trial begins and would later convict John T. Scopes of teaching Charles Darwin's evolutionary theory at a Dayton, Tennessee high school, which violated Tennessee law. He is fined $100 for the charge. November 21, 1925 - Lava Beds National Monument in California is designated by President Calvin Coolidge. It was the site of a volcanic rock, natural fortress used by the Modoc Indians during the Modoc War of 1872-3. November 28, 1925 - The Grand Ole Opry transmits its first radio broadcast. March 16, 1926 - Robert H. Goddard demonstrates the viability of the first liquid fueled rockets with his test in Auburn, Massachusetts. The rocket flew one hundred and eighty-four feet over 2.5 seconds. May 9, 1926 - The first flight to the North Pole and back occurs when pilot Floyd Bennett, with Richard Evelyn Byrd as his navigator, guided a three-engine monoplane. They were awarded the Medal of Honor for their achievement. May 20, 1926 - Air Commerce Act is passed, providing aid and assistance to the airline industry, plus federal oversight under the Department of Commerce for civil air safety. May 31, 1926 - The Sesqui-Centennial Exposition opens in Philadelphia to celebrate the one hundred and fiftieth birthday of the United States. With nineteen nations and four colonies participating, the event failed to live up to the wonder and expectation of the former Centennial Exposition, and is often regarded as a failure in world expo circles. Due in part to inadequate preparation and a very wet summer, it closed on November 30 a disappointment with 6 million visitors in total attendance. November 15, 1926 - The NBC Radio Network is formed by Westinghouse, General Electric, and RCA, opening with twenty-four stations. March 5, 1927 - The civil war in China prompts one thousand United States marines to land in order to protect property of United States interests. April 22 to May 5, 1927 - The Great Mississippi Flood occurs, affecting over 700,000. May 20, 1927 - Charles Lindbergh leaves Roosevelt Field, New York on the first non-stop transatlantic flight in history. He would reach Paris thirty-three and one-half hours later in the Spirit of St. Louis, his aircraft. A ticker tape parade would be held in New York City after his return on June 13. October 4, 1927 - Work on the gigantic sculpture at Mount Rushmore begins. Sculptor Gutzon Borglum would complete the task of chiseling the busts of four presidents; George Washington, Thomas Jefferson, Abraham Lincoln, and Theodore Roosevelt, fourteen years later. October 6, 1927 - The advent of talking pictures emerges. Al Jolson in the Jazz Singer debuts in New York City. September 7, 1927 - First success in the invention of television occurs by American inventor Philo Taylor Farnsworth. The complete electronic television system would be patented three years later on August 26, 1930. March 26, 1928 - The Tennessee national military park known as Fort Donelson National Battlefield, site of the first major Union victory in the Civil War and known for the unconditional surrender of Confederate troops to Brigadier General Ulysses S. Grant, is created by legislation signed into law by President Calvin Coolidge. May 15, 1928 - The first appearance of Mickey and Minnie Mouse on film occurs with the release of the animated short film, Plane Crazy. June 17, 1928 - Amelia Earhart becomes the first woman to fly over the Atlantic Ocean. November 6, 1928 - Herbert Hoover wins election as President of the United States with an Electoral College victory, 444 to 87 over Democratic candidate Alfred E. Smith, the Catholic governor of New York. December 21, 1928 - The United States Congress approves the construction of Boulder, later named Hoover Dam. January 15, 1929 - Future Civil Rights leader Martin Luther King is born in his grandfather's house in Atlanta, Georgia. February 14, 1929 - In Chicago, Illinois, gangsters working for Al Capone kill seven rivals and citizens in the act known as the St. Valentine's Day Massacre. October 11, 1929 - JC Penney opens its Store #1252 in Milford, Delaware, the last state in the Union to have one of their stores. The growth of the nationwide chain indicated the prosperity of the decade only two weeks before the stock market crash of 1929 would ensue. 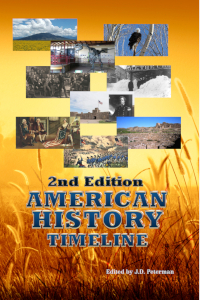 October 25, 1929 - The Teapot Dome scandal comes to a close when Albert B. Fall, the former Secretary of the Interior, is convicted of accepting a $100,000 bribe for leasing the Elk Hills naval oil reserve. He is sentenced to one year in jail and a $100,000 fine. October 29, 1929 - Postwar prosperity ends in the 1929 Stock Market crash. The plummeting stock prices led to losses between 1929 and 1931 of an estimated $50 billion and started the worst American depression in the nation's history. 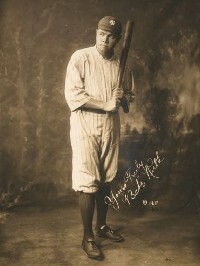 Future Hall of Fame player Babe Ruth. Courtesy Library of Congress. 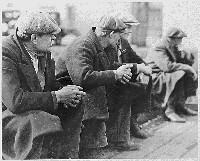 Out of work workers during the Great Depression. Courtesy National Archives. 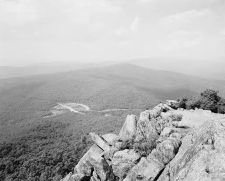 The Appalachian Trail, first proposed in 1921 and completed seventeen years later. Scene from trail in the Shenandoah Mountains. Courtesy Library of Congress.